174 other birds have this item in their bag or wishlist! 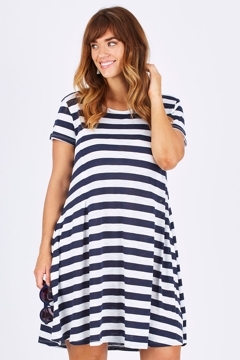 Breeze through Summer with the Panel Striped Dress from bird keepers. This simple, A line style dress will have you easily step through those warm days. This is a great lightweight summer dress, I’m actually wearing it today! It is quite roomy so you can go down a size, easy to wear and I love the pockets. It's loose, comfortable, fairly flattering design, I'm 174 cms & it came up a few cms over my knees. I'm a 16 & the 14 fits easily & is still loose. The only thing is the cotton material's a lot thinner than it seems on the site & I'd really appreciate a better quality fabric that would last for a 90 dollar dress. Great to get it on the wait list! A very comfortable fit and love the pockets. I'm usually vary between size 12 & 14 - in this case the 12 was perfect. Looked better quality in the picture. Quite see through and looked like a sack. Would recommend going down a size or two. I don't wear dresses often but love the feel and look of this one. The shape is flattering and flows over the bits you want to hide. Love navy stripes. Nice and cool for summer. A great throw on dress that will see many outings this summer-home, beach, shops, anything. The fit is very roomy so I returned the 14 and went a size smaller, kept the 12.